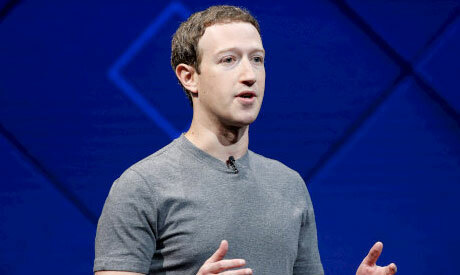 A British parliamentary committee on Tuesday asked Facebook chief Mark Zuckerberg to appear before it to explain in person claims that millions of users' data was harvested for political campaigns. Damian Collins, chairman of the House of Commons digital, culture, media and sport committee, wrote to Zuckerberg asking for his own account of "this catastrophic failure of process". The request was made as part of the committee's ongoing investigation into fake news, which saw its members last month visit Washington for hearings with officials from Facebook and Twitter. But it follows allegations that data from up to 50 million Facebook users was harvested by a British company, Cambridge Analytica, for use in the election campaign of US President Donald Trump in 2016. "Following material published in the UK Guardian and The New York Times over the past few days, the committee would like to request that you appear before us to give oral evidence," Collins wrote. "The committee has repeatedly asked Facebook about how companies acquire and hold on to user data from their site, and in particular about whether data had been taken without their consent. "Your officials' answers have consistently understated this risk, and have been misleading to the committee. "It is now time to hear from a senior Facebook executive with the sufficient authority to give an accurate account of this catastrophic failure of process." He added: "Given your commitment at the start of the New Year to 'fixing' Facebook, I hope that this representative will be you." Collins set Zuckerberg a deadline of March 26 to reply.